Salmon night is the best at our house… I wish I could invite all of you for my buttery, tender fillets packed with health-boosting omega-3s. 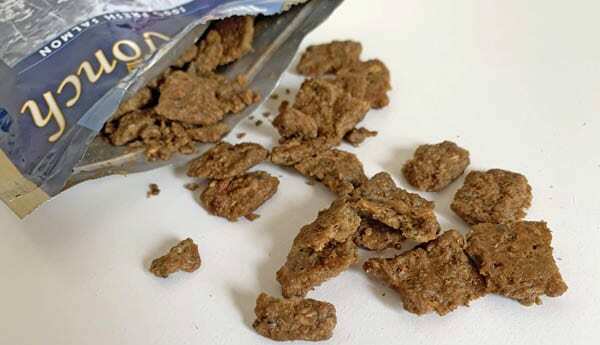 Instead, I’m going to introduce you to the next best thing – Kronch USA’s Norwegian salmon oil and treats. Now, Matilda and Cow don’t have to wait for salmon night – they get to enjoy salmon anytime. 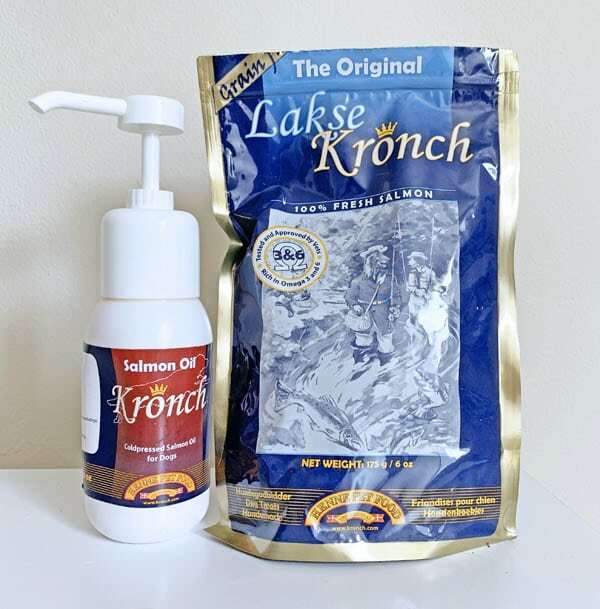 Kronch is a small Danish company that makes salmon oil and treats. Now that they’ve introduced their products to the United States, our dogs get to enjoy them. Their products are made with fresh Norwegian salmon – a combination of wild-caught and farmed – with natural preservatives and absolutely no fillers. I’ll go into their unique sourcing and extracting process later on, but first: you’re probably wondering why you should feed salmon oil at all. Why Feed Salmon Oil Instead Of Fish Oil? There’s so many fish oil supplements for dogs out there, made out of all different sea creatures. All contain omega-3 fatty acids that benefit the immune system, can help reduce inflammation associated with many conditions, including itchy skin and arthritis. It’s also good for brain health. I asked the Kronch company why they make theirs with salmon, and the answer surprised me. Most fish oil contains high levels of vitamin A – a fat soluble vitamin that builds up in your dog’s fatty tissues and liver. Over time, your dog is walking around with more and more vitamin A in their body. After prolonged use, your dog is at risk for Hypervitaminosis A or Vitamin A Toxicosis. Salmon oil, on the other hand, does not have high levels of vitamin A. So, you can feed it without worrying about overdosing your dog. Vitamin A overdosing is also a concern with liver – especially those concentrated, freeze-dried liver treats that your dog could eat 100 of – so be mindful of that when you’re choosing treats, too. You may have heard that fish oil depletes the body of vitamin E, so you need to make sure your supplement of choice contains it, or pair it with a vitamin E supplement. So, you can safely feed salmon oil as-is with your dog’s kibble, canned or raw diet. It’s also okay to use an additional vitamin E supplement or feed whole food sources because it is an antioxidant that protects the body against free radicals and supports the immune system. For Matilda and Cow, I crack open one of my own vitamin E gel capsules into their food once per week, and they also get whole food sources like cooked spinach, avocados and almonds whenever I happen to be eating them. 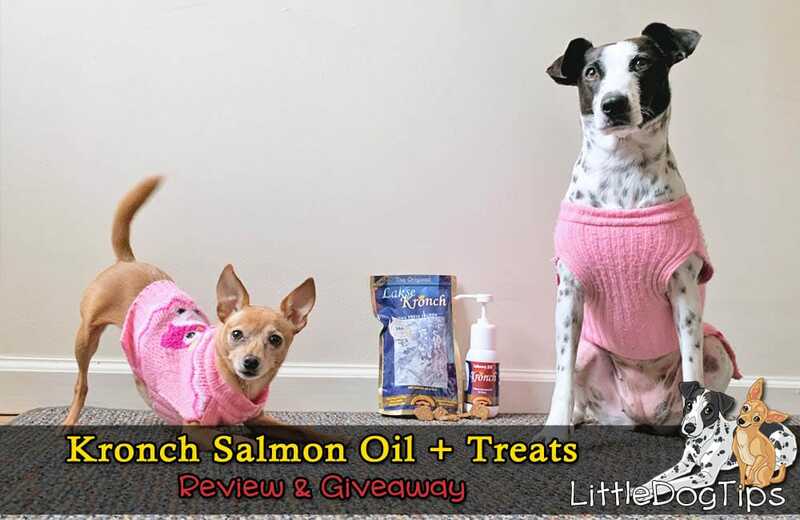 Why Choose Salmon Oil From Kronch USA? You can get salmon oil from several sources, but I’m excited to introduce Kronch’s because of their unique sourcing and extraction process. They use both wild and farmed salmon (at a 70/30 ratio) to create their products. The wild-caught salmon is actually sourced from the factory next door to them that processes salmon for human consumption. Previously, the fillets were packed and processed, while the heads, spines and tails were discarded. Now, Kronch uses those heads and tails to make salmon oil for dogs. Not only does this mean they help reduce food waste, they also do not need to fish for salmon as a result. Wild salmon are mesopredators, meaning that they are both the hunters and the hunted. When overfished, the balance of the food chain in the ocean is thrown off. So, using leftover heads, spines and tails instead of fishing for more salmon is an eco-friendly option. So why does Kronch also used farmed salmon? Wild salmon does not contain as much salmon oil as farmed salmon. That means an evisceration machine is needed to extract more of that oil. “By using gentle mill stones to extract our oil, we never raise the temperature above 140 degrees Fahrenheit — omega-3 fatty acids are fragile and easily destroyed by the heat that an evisceration machine generates,” says Sheffield. We’ve been using the salmon oil and treats for a few weeks now. I don’t remember to use the salmon oil every day, especially if my dogs are already having fish. Even so, I’ve noticed less shedding. I’m not sure if I can attribute this to the change in seasons, and overall, it would take more time to see significant results. Every dog can benefit from a salmon oil supplement, though, so what really matters is buying from a source that you trust. Taste-wise, my dogs adore the oil and treats. I’ve been able to get Matilda to finish her vegetables by drizzling her serving of salmon oil over them. I think it would be especially useful for kibble feeders whose dogs need an extra kick of flavor. The treats are PERFECT for teaching new tricks – my dogs would do anything for them. It’s a great way to keep your dog motivated without having to use too many treats. You can also crush them into smaller pieces and mix them with other treats or meals. Where Can I Get Kronch USA Salmon Oil And Treats? The best place to shop for Kronch single ingredient salmon treats and salmon oil on Amazon. Might as well add them to your cart and get that sweet free 2-day shipping! You can also try your luck in our latest giveaway – one winner will get a 250mL bottle of salmon oil and a bag of salmon treats. Must be 18 or older to enter, USA only. 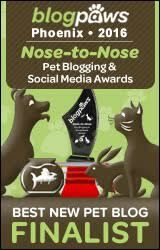 Can’t wait to try the salmon oil and salmon treats and possibly win the contest to win both. When I visit my dad, I always bring my doggie brother a treat. He knows when I come, goodness is in my purse! Gibson would LOVE these. Thanks for this opportunity. I think my 14 year old Boston could benefit from the oil. He needs to keep his skin healthy and shiny. Our nine year old husky is at that age where he can use all the help he can get to stay healthy and ward off the effects of aging. 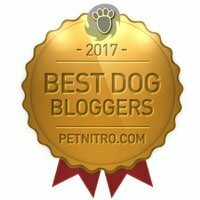 Interesting blog post I will definitely be giving my little dog selkie Salmon oil from now on! I have a lab who suffers from dry skin and allergies so I would love to see how this works for him! My dogs love sardines, salmon and all fish. It seems like a healthier choice and would love to try it for our family pet. I would like to give my dog nothing but the best and this seems to fit the bill. I’d love to try these to help with my dogs coat. He is getting older and his hair is really getting thin. I would love to have my dog try this to see if it helps her coat. A good source of omega-3 for my dog. my dog gets fish oil in his food every day for skin issues. I would love to try this kind! I would love to see if these treats would have some affect on my dog’s skin. I really need to find a solution. I would like to try it because my dog would like the taste and it would be good for her. I have two fur babies. One has allergies. I will try these to see if they help. I think it would help my dog’s skin problems and I’m sure my dog would like it also! I’ve heard that salmon oil (and salmon) is very good for dogs (and cats). I’m always looking for ways to enhance the health and happiness of my furbabies and would love to try these products for them! I would like to try because I believe in my dogs fresh and healthy food for her. I would like to try for my little dogs that have dry skin to see if this would help. We have two Huskies that are getting older and can use all the healthy food we can offer. Seems like a great treat and good for my dog’s immune system. so my dogs can be healthy and have shiny coat . I give my dog a fish oil tablet daily for arthritis but this sounds like an even better alternative. Would love to try it. My pup gets fish oil daily and I am intrigued by what I read about salmon oil. I would love to try something healthy for my dog. He has never tried salmon oil before and I am anxious to see if he will like it. He has a healthy appetite and will try most anything. Thank you for the chance. My little Pom is a vaccuum, he’ll est anything! These treats sound like a healthy alternative. It would be great to give our dogs something that’s good for them and for us (by having less shedding)! My dogs are both getting older, and I would love to help them be more healthy and active. My shep loves salmon and once she helped herself to a piece of smoked salmon that I thought ladyfriend had taken. My dachy could use some healthy treats. My Emmy has itchy skin all the time, I would love to try this! I would love to try the salmon oil. My dog has very thick coat, and her skin dries out. I think this would really help. I would love to try the salmon oil for the anti aging and health benefits/ for a healthy and shinny coat. I would like to try the salmon oil, because I love my dogs and want to keep them healthy as lon as possible. salmon oil is so good for your pets for many reasons. my dogs love salmon, sometimes i cook it for them. my girls are 8,9 now so i worry abt them as they get older. i cant imagine my life without them. As a healthier option for me and my family. I think my dogs would love the taste. Since they are all over 8 years old, I am trying to find the healthiest options for them. I have been reading a lot about dry skin on my dog and this sounds like it could help him. This seems like a good quality product to try him on. My dog, Ruby, suffers from dry. itchy skin and I think this would help. for the healthier aspect. would love to try. My dog loves Salmon! 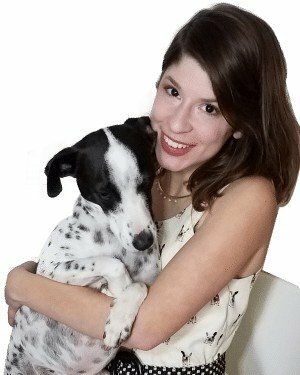 She has sensitive skin and I am always looking for food and treats that help her improve. I love to try new products made with salmon. My dog needs food and treats that help her have a great skin. It is not easy to find healthy treats. These on the review look like a great choice! I have a large dog who will probably need supplements like this as he ages! I think it would help my dog’s dry skin from Colorado arid climate. Thank you for bringing Kronch salmon oil and treats to my attention. I visited your Facebook page. I found the post saying that, “Professional Nascar and ARCA Driver, Cassie Gannis gave our snacks a shot for her 4 dogs and cat.” very interesting. My bulldogs have such dry skin. I would love to try this to help alleviate it. My 10 year old dog was just diagnosed with some arthritis in her right hip. I would love her to try these to see if they help. Thank you! I would like to see if it helps my dog with knee and arthritis issues!! We have two long haired mixed breed dogs. Artie is a golden retriever mix and Bowie is a husky mix, I willing to try anything that results in less dog hair. would love to win these for our dog, Lucky! I would love to try this as it would help with our Rusty’s dry skin. I would love to try this product with my 8 year old German Shepard because she needs help reducing inflammation associated with severe arthritis and for her itchy, dry skin. My dog loves salmon, so I think he’s love salmon oil. My dog would enjoy the Kronch Salmon Oil and Treats. I would like to try it for my sweet Buddy who is a little older and I think would love this. I want to try this to add some variety to my pets’ diets.